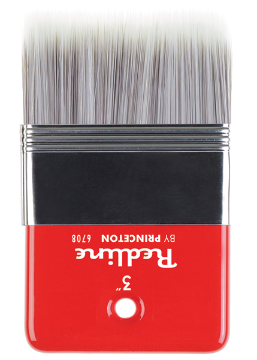 Developed and handcrafted by Germany’s most experienced brush makers, each brush provides control and consistency when painting large surfaces. Multiple synthetic filaments and hair lengths hold more paint, making large jobs faster and more efficient. 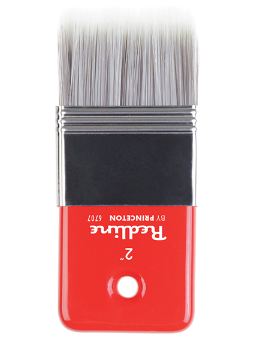 Redline Brush handles are multi-coated with lacquer and are made from European beech wood for enhanced durability. Four different brush shapes expand the creative versatility of these brushes. Note: Made in Germany. High Quality. Princeton Redline - Angular Long Handled Mottler Brush - 2"
Princeton Redline - Angular Long Handled Mottler Brush - 3"
Princeton Redline - Flat Long Handled Mottler Brush - 2"
Princeton Redline - Flat Long Handled Mottler Brush - 3"
Princeton Redline - Oval Long Handled Mottler Brush - 2"
Princeton Redline - Oval Long Handled Mottler Brush - 3"
Princeton Redline - Flat Paddle Brush - 2"
Princeton Redline - Flat Paddle Brush - 3"